1920's Ford Model T car & Fordson garage invoice. Homepage. 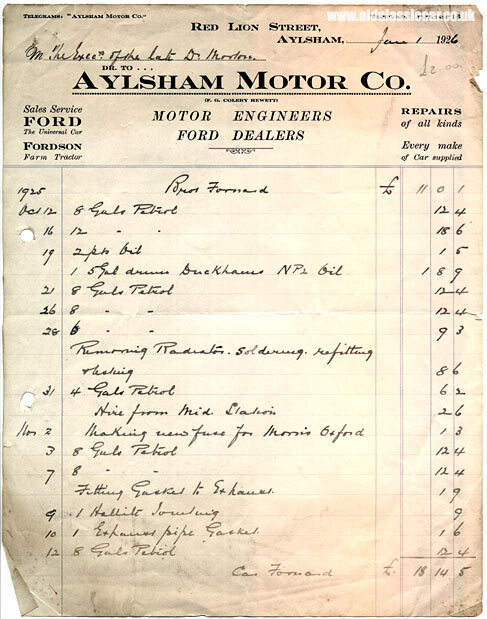 This page: An invoice for work done to an old car by a Ford garage in Aylsham, dated 1926. Garage repairs by a Ford garage in the 1920s. This invoice was issued by the Aylsham Motor Company to the executors of an estate in June 1926, but related to repairs undertaken on, and fuel supplied to, a motor-car in late 1925. This vintage-era garage was situated on Red Lion Street in the town, contactable via telephone on Aylsham 16, or via telegram to "Aylsham Motor Co.". The garage's usual trade was in the sale and service of Fords, which in the 1920s can only mean the Ford Model T - "The Universal Car" as both Henry Ford himself, and this motor repairers, refer to it as. Buyers looking to acquire a new Fordson tractor, or have work done to their existing Fordson, could also be accommodated. The director of the workshop is given as F.G. Coleby Hewett. The garage didn't restrict its activities solely to Henry's finest though, as the hand-written entries on this invoice refer to work done to a Morris Oxford, of the "bullnose" variety. The heading also suggests that every make of car could be supplied, presumably including the popular "light cars" and "cycle cars" of the day, right through to luxurious machines from the likes of Napier and Daimler. Whether all the entries relate to the Morris, or just the one referring to the making up of a new fuse, isn't clear, but evidently whatever car this relates to, it saw regular use. Eight gallons of petrol were purchased on the 12th October for example, with a further twelve purchased on the 16th. Three days later three pints of oil were added to the engine, and indeed a five-gallon tin of Duckhams NP2 oil was purchased for it. Further top-ups of motor spirit took place on the 21st, 26th, and on the 28th, after which a leaking radiator was repaired. Four more gallons were pumped into the Morris' fuel tank on the 31st, followed by another eight on the 3rd November, eight more on the 7th, and the same again on the 12th. Inbetween, some minor repairs were undertaken to the exhaust system. But what of this former Model T garage? It's listed in the RAC Handbook for 1928/1929 at the Red Lion Street address. Yet in the 1949/1950 Handbook the firm is still listed, but now at a Norwich Road location, so evidently at some point the garage re-located. There seem to be few genuine references to this old company online, although apparently in 2006 the Red Lion Street site was cleared in readiness for the building of a new Tesco store. Before this though, I found references to an archaeological dig taking place at the site of a ".. former garage site on Red Lion Street .." which uncovered the remains of several medieval buildings, and post-medieval cellars that belonged to inns that once occupied the site, in the days before the garage. And regarding the named company director? other than a possible reference found online to a Mr Frederick George Coleby Hewett, relating to the winding-up of an un-related company, there seems little information.